Duality of vision. At least that’s what I’m calling it. As of May 4th last year, along with my “new perspective,” my way of looking at things, physical things, has changed. 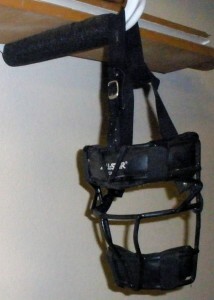 For example, driving into my garage every day I see Maggie’s catcher’s mask she used to wear while playing softball. It hangs just inside the garage door right where I park the car. When I see that mask, I think of the soft plastic that used to touch her forehead, the grill she used to breathe and taunt through, the strap that used to get tangled in her hair…. Such a simple object yet so filled with the richness of her experiences, the richness of her. I also see it as a creepy object a dead person used to wear. Both perspectives exist simultaneously, separately and incongruently in my mind. One of those perspectives exists only in my heart.